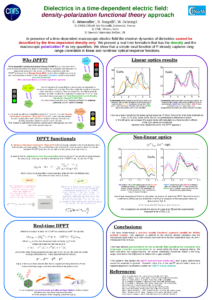 A new poster on our work on real-time density polarization functional theory. In presence of a time-dependent macroscopic electric field the electron dynamics of dielectrics cannot be described by the time-dependent density only. We present a real-time formalism that has the density and the macroscopic polarization P as key quantities. We show that a simple local function of P already captures long-range correlation in linear and non-linear optical response functions. This entry was posted in berry phase, optical properties, research on 18/08/2016 by attacc.